All or some of these associated texts have been combined by the Fourth Evangelist into the one amalgam of verse 31. The discourse is broken by the short interruptions of verses 30–31, 34, 41–43, 52, which, by introducing live dialogue, help to keep the audience’s interest while at the same time pointing out the precise difficulties felt by both the Jews of Jesus’ time and of John’s own later period. This discourse on a biblical text — what the Jews would call a midrash — follows a phrase-by-phrase order. It will treat in order: He gave; bread from heaven; to eat. Let’s observe this happen. a) He gave (vv. 26–34). In this first section, the emphasis lies on the giving. Jesus will give (vv. 27, 34), not as Moses gave (v. 32) a perishable manna food of mortality, but as the Father, source of eternal life, gives (v. 32). Thus far, Jesus appears as the giver of bread and therefore as the new and superior Moses. b) bread from heaven (vv. 35–47). The insistence now shifts to the bread from heaven that Jesus not only gives but actually is (vv. 35, 38, 41, 42). It is important to note here that the operative verb is “believe.” Jesus as bread from heaven is accepted and consumed through the belief required in verses 35, 36, 40, 47. What this means is that this is a faith nourishment. Jesus is bread from heaven, feeding all believers, in the same sense that Old Testament wisdom nourished all who accepted it (Prov 9:1–5). c) to eat (vv. 48–59). In this final section, the vocabulary changes radically. The significant words are “flesh,” “blood,” “eat, ” “drink.” Note the constant repetition of “eat” in vv.49, 50, 51, 52, 53, 54, 58. “Feed on” (an even more physical verb in the Greek than “eat”) occurs in v.57. These verbs become overwhelmingly insistent, as does the constant reference to flesh and blood, food and drink. The meaning of the discourse has changed. Where in the preceding section Jesus nourished through wisdom-revelation those who believed, the verb “believe” has now completely disappeared and is replaced by “eat,” “feed on.” This is language which clearly speaks of sacramental nourishment, of the food and drink that one eats and feeds upon, of the Eucharistic nourishment provided by the flesh and blood of the Son of Man (v. 53). The “Son of Man” phraseology tells us that this is not the physical flesh and blood of the earthly Jesus and that we are asked to eat and drink but the spiritual, Spirit-filled flesh and blood of the heavenly Son of Man. Verse 58 ties the discourse together by referring back to the central phrase of verse 31. What this discourse has done, therefore, is to deliver a rich and multi-faceted exposition of the Jesus-as-Bread-of-Life theme. Jesus is first of all the giver of the bread, a new Moses. He is also the bread of wisdom and revelation who nourishes all who come to him in faith. He is, finally, the Eucharistic source of eternal life for all who eat and drink the flesh and blood of the heavenly and glorified Son of Man. Because John uses this Eucharistic material in this Bread of Life homily, it will not be too surprising — yet surprising enough — that the Eucharist will not be mentioned at the Last Supper. Its material has been transferred to this incident. John has also succeeded, with this transfer, to unite in this one chapter the essentials of Christian Eucharist, the word and the bread — the revealing word of vv.35–47 and the sacramental bread of vv.48–59. 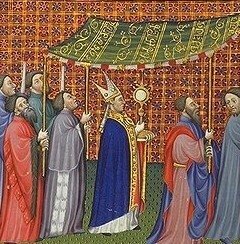 This entry was posted in Scripture and tagged Bread of Life Discourse, Corpus Christi by Friar Musings. Bookmark the permalink. This verse has always been something beautiful to me: “Whoever eats my flesh and drinks my blood remains in me and I in him.” How grateful are we for our Savior!